This time is going so quick, though I have a dreaded feeling that I won't be saying that when I'm as big as a house. I'm starting to feel super excited about certain things, and more and more nervous about others. I've been starting to research different things, as far as feeding and diapering, and trying to compile a list of things we'll actually need, and not just a bunch of crap that I want lol. I've been really lucky so far with no morning sickness, just feeling nauseous off and on and feeling super tired all the time. I'm completely unmotivated and am afraid that I'm gaining too much weight, since my dr has pointed out that pre-pregnancy, I am considered "obese", so any more weight can hurt the baby, or my health. Yippee! *sigh* 21 years of being a skinny sting bean and one bout of being depressed and now I'm obese. But I was glad to hear that the baby, so far, is healthy. Heartbeat was 171, and I got to see the baby slowly forming. Well, I've completely failed everyone in staying on top of things here. But I'll start with the good news. Jer and I are having a baby! I'll be posting about this a lot, so I won't bore you now lol. 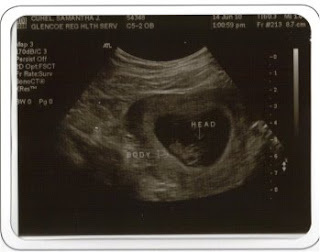 But baby is expected on January 17, 2011. Now the bad news; the company basically fell apart. I won't go into details because it's just very upsetting for me and I just can't deal with it right now. Because of the loss of income, and Jer not being able to start work in time to get paid by the first, we don't know how we're going to make our rent this coming month. This has been the biggest thing on my mind, and it's been very upsetting for me. I know it's bothering Jer too, but he hides it better than me. I honestly don't know what we're going to do right now.